Bridge Partner Philadelphia University Combines with Thomas Jefferson University to Form the New Jefferson! It’s official– Bridge partner, Philadelphia University, combined with Thomas Jefferson University to create a comprehensive national university that will be now be called Jefferson (Philadelphia University + Thomas Jefferson University). The union will leverage the combined expertise of these two historic universities, both of which were pioneers in providing bold, innovative, and transdisciplinary approaches to learning. They are now joined to mobilize a new model that will further transform higher education. According to Stephen Spinelli Jr., PhD, president of Philadelphia University, who will serve as chancellor of the combined university, learning will be supported by design and systems thinking, innovation, entrepreneurship, empathy, and the modes of thought central to the liberal arts and scientific inquiry. In particular, the new Jefferson will build on Philadelphia University's and Thomas Jefferson University's proven approaches, such as Nexus Learning, to aggressively add even more value for students through leading-edge programs in emerging professions; accelerated programs for earning undergraduate and graduate degrees in a shorter time; opportunities for scientific and applied research, and a new model for experiential learning and internships with some of the country's top employers. - The combined universities will now include nine colleges and three schools. - Jefferson will be home to more than 7,800 students, 4,000 faculty members, and 78,000 alumni, making for a larger network than ever before. - The Philadelphia University Honors Institutes and The Philadelphia University Design Institute will be formed, enabling the new Jefferson to create initiatives such as fellowship programs, national lecture series, and research programs. Jefferson will now span a greater geographical area, too, with campuses in Center City, East Falls, Montgomery County, Bucks County and Atlantic County. Philadelphia University now comprises the East Falls campus of the new Jefferson. The on-campus BridgePathways Intensive English Program, located on the East Falls Campus, welcomes students from around the world who have a common goal of improving their English in order to pursue university studies. The program will now accept both conditionally admitted students to Jefferson, as well as any qualified degree-seeking students who wish to attend Academic English classes to prepare for university. 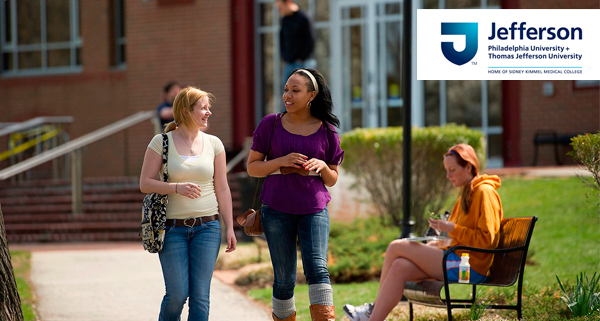 The Pathways program on the campus of Jefferson is an especially attractive option for international students due to its location in Philadelphia, a major U.S. city, and because of the range of over 60 degrees available, such as Business, Fashion, Engineering, Architecture, Medicine, Science, and Textiles. BridgePathways students, such as Art Design major, Tianyi Xie, from China, describe the on-campus experience best in their own words. Learn more about BridgePathways at Jefferson here. Or watch a video about the recent academic union of Philadelphia University and Thomas Jefferson University: PhilaU and TJU: Defining What’s Humanly Possible.